This flavour is on our all-time best sellers list. 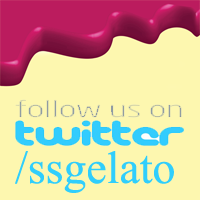 What’ you’ll find is a high cocoa-mass chocolate made as only Salt Spring Gelato can deliver. A kid’s favourite that’s fun to make because it makes our factory smell like bubble gum! Only my mom can make a better cheesecake – but it’s very close. Try it and see why you’ll swear you’ll swear you’re eating a real cheesecake. DELICIOUS BUTTER-ROASTED PECANS IN A BUTTERY GELATO BASE. OH MY! THE PERFECT POST-DINNER TREAT ON SALT SPRING AND BEYOND! This exotic flavour combines our famous Belgian Chocolate with the bite of our rich, delicious ginger. The classic combination of milk chocolate and rich, creamy peanut butter. Sensational! One of our best sellers at the Salt Spring Saturday Market. Enjoy this refreshingly tropical treat without those pesky Saturday crowds. RICH AND MOIST COCONUT CHUNKS WITH DARK CHOCOLATE SWIRLED THROUGHOUT. WANT SOME? A popular gelato featuring wafer cookies in a custard-like base with deep swirls of dark Belgian Chocolate. Popular with little kids and big kids. Our Cotton Candy gelato isn’t just for kids – oh no. It’s fun, it’s blue and it’s now available in pints. A little coffee, a little caramel with a big taste! We take or Espresso gelato and kick it up a notch by adding almond and swirling in some dark Belgian Chocolate. Named after our neighbour to the east. We start with our rich and delicious Belgian Chocolate then add caramel and toasted pecans. Oh my! A classic Italian blend of creamy milk chocolate and roasted hazelnuts with a Salt Spring kick. Discover why it’s a fan favourite! There are more requests on exactly how we make this flavour than any other. Don’t you worry, we’ll aways make plenty. A Childhood favourite done the Salt Spring Gelato way. The finest white chocolate swirled with dark chocolate hazelnut. No toy required. Coconut and mango – the perfect tango! Our classic gelato flavour is enjoyed by all ages. Real Canadian Maple Syrup with Salt Spring roasted walnuts. Named after Salt Spring’s largest mountain, Mount Maxwell Mint has a bold flavour with just the perfect amount of Belgian chocolate chips. Do you have passion for passion fruit? If so, belly up to the gelato bar and dig into this oh so yummy treat! One day some time ago, a man named Massimo came to our factory from Italy to show us how to make the best Pistachio gelato in the world. Thanks Massimo! Rocky Road Gelato! Oh ya! Now our best selling Gelato, this flavour was first featured on Salt Spring at Harlans Chocolates & Gelato and can now be enjoyed everywhere! Peanut lovers take heart, Salt Spring Gelato makes this oh so delicious treat for all ages. You’ll taste the salt and sweet in this flavour wallop. Can you say YUM? 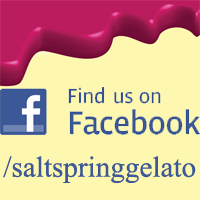 A classic Italian treat that only Salt Spring Gelato can deliver. Think creamy, Italian chocolate chip. Hmm…..
There’s just something about Strawberry Cheesecake that makes us so thankful to live on Salt Spring. Is this heaven? A great peanut butter combination! Ah Tiramisu, the exotic Italian dessert now can be enjoyed anytime. You’ll discover mascarpone cheese, sweet Marsala wine and a hint of coffee. One of our most versatile flavours enjoyed by the young and young at heart. Pure vanilla beans, pure flavour. Why let the Irish have all the fun? Our whiskey is best served smooth and creamy! Dessert anyone? Plump, sweet raspberries are the perfect compliment to our smooth, velvety white chocolate. Scrumptious! Those who know our Wild Rose always say that it tastes like a rose smells. Try one of our most exotic flavours.